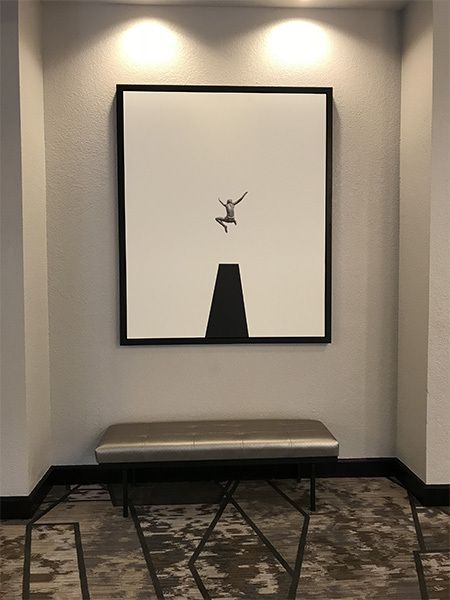 Kevin Barry Fine Art headed out to Palm Springs last month for a fabulous and nod-worthy event: the 2018 Remington Leadership Conference. 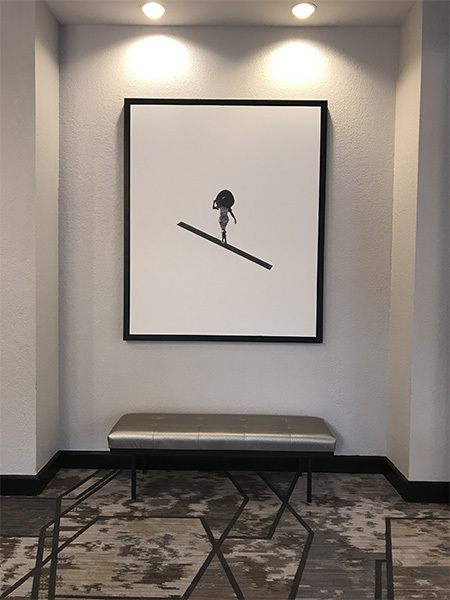 The event was held at the recently revamped Renaissance Palm Springs, which KBFA helped outfit in eye-grabbing art (project gallery coming soon). With 50 meeting rooms and 410 guest rooms, the hotel group wanted to choose a large capacity venue to say goodbye to their longtime president, Mark A. Sharkey. And what a success it was. 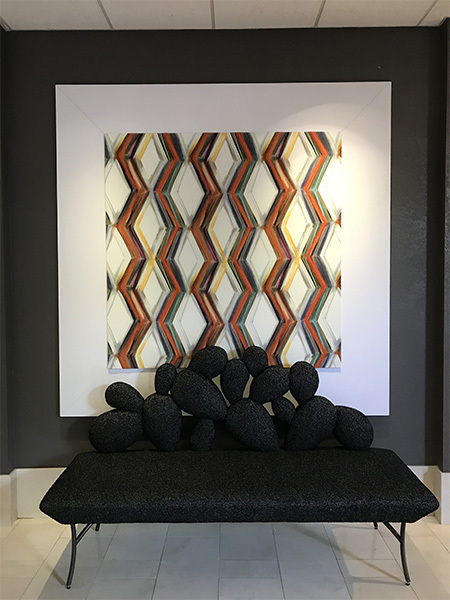 Making a spectacular display of itself was a mixed media canvas and textile piece located above the bench in the lobby for all to admire. 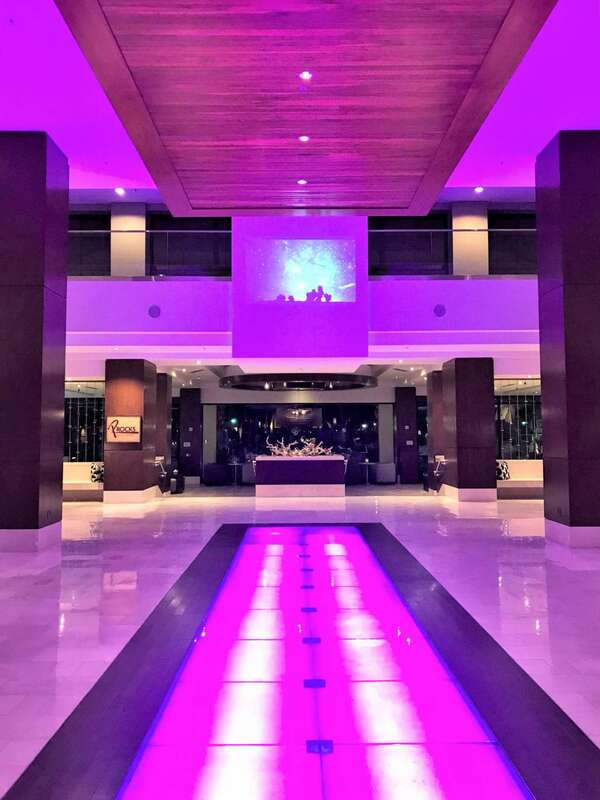 The one-of-a-kind video-art piece installed directly above the main entryway in the lobby was a striking vision. It showcases a time-lapse video exhibiting scenes such as desert sunsets and cars speeding down Palm Springs area highways. 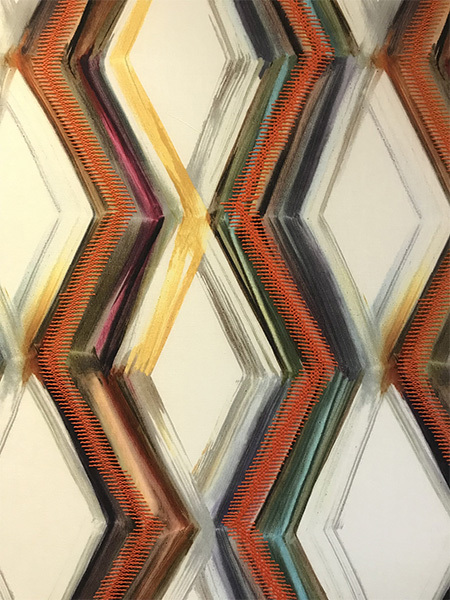 The work is viewable as you walk through the front doors creating a supreme spectacle with its projection on the mezzanine wall, and hovering over a series of beautifully illuminated purple floor tiles. 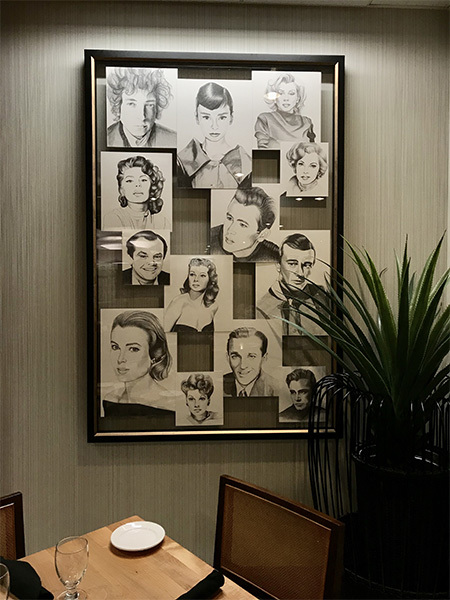 Val Schub, a leading Art Consultant at KBFA, was responsible for creating many of the original, hand-sketched celebrity portraits that are framed throughout Date Restaurant, and proved to be a huge talking point for many of the hotel’s employees and guests. 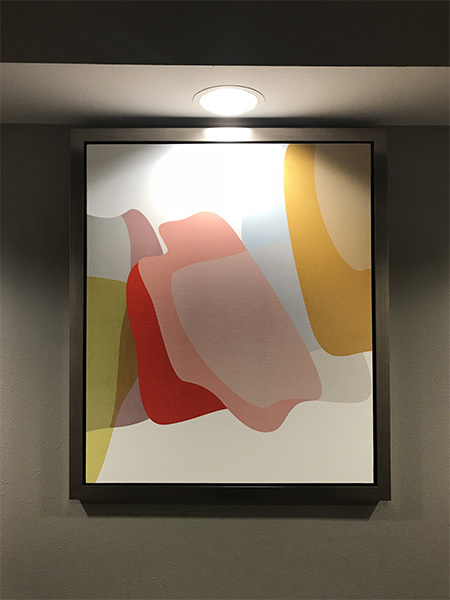 The majority of the other art in the hotel is Palm Springs-relevant through its use of modern shapes and warm Mid-century colors. There are several reprints of vintage Palm Springs paraphernalia; such as magazine covers from the 1950s, and loud black and white photos. All of these pieces help set the tone for the hotel, a place where one might be inspired to sip a martini poolside, pop in a pair of earbuds and tune in to their favorite Rat Pack singer. As for the event itself, the first evening began with cocktails under the stars and a slew of unique food-tables, serving delicacies from made-right-in-front-of-you risotto to individually-packaged fresh sashimi bites. The guests were invited to pick up name tags and coupons at the check-in table, which allowed you to purchase goods from a number of name brands ranging from Kate Spade to Ray-Ban to Lululemon. This generous gesture did not go unnoticed by Remington’s grateful sponsors in attendance. Although the temperatures were uncharacteristically cold for a Southern Californian night, this event was jam-packed with a crowd of happy, chatting professionals until the wee hours. The next day consisted of a brunch, followed by a short trade show. Here, KBFA, along with a number of Remington’s other sponsors, set up shop. Jeff Hill of Hill & Associates, the Dallas-based multi-line hospitality company, was set up near the KBFA booth to represent one of his commercial furniture lines. The Remington Hotels leaders came and went to the various booths, meeting and greeting their proud sponsors, and grabbing bites of food as they went. During this time KBFA had productive meetings with the smart and savvy head of purchasing, Marla Davis, and the elegant and talented SVP of design at Remington, Carla Niemann. The words of wisdom they shared are not to be forgotten, and neither is this event. Hope you enjoyed our recap of a wonderful day full of art and fun!